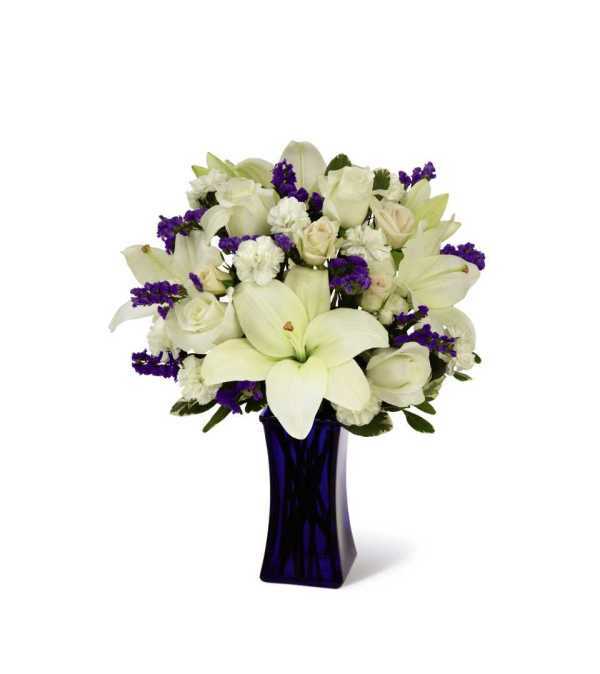 The FTD® Beyond Blue™ Bouquet is a wonderful way to send peaceful wishes to your special recipient. Bringing together gorgeous white Asiatic Lilies, white roses (in Deluxe and Premium versions), and white mini carnations accented with blue statice, cream spray roses, and lush greens, this stunning bouquet captivates at every turn. Presented in a dark blue glass vase to contrast with its bright white blooms, this beautiful flower arrangement will make an excellent thank you, get well, engagement or sympathy gift. We ordered the standard Happy Times bouquet for my grandma on her birthday. The flowers were beautiful and brought tears to her eyes. She extends her compliments to the kind delivery man, and the person who created the arrangement. Overall wonderful experience. Thank you so much to The Bloom box for the beautiful arrangement I ordered for my daughter Natasha.She is so happy with them and so am I.She sent me a photo and they are absolutely gorgeous. Flowers were beautiful and delivered at time requested. The ladies are very helpful and wonderful every time. The BloomBox is a Lovingly Florist in Brandon. Buying local matters. Discover how Lovingly supports local florists. Copyrighted images herein are used with permission by The BloomBox.